Anthyllis Vulneraria Extract, Prunus Armeniaca (Apricot) Kernel Oil, Prunus Amygdalus Dulcis (Sweet Almond) Oil, Arachis Hypogaea (Peanut) Oil, Daucus Carota Sativa (Carrot) Root Extract, Hypericum Perforatum Flower/Leaf/Stem Extract, Helianthus Annuus (Sunflower) Seed Oil, Calendula Officinalis Flower Extract, Triticum Vulgare (Wheat) Germ Oil, Melia Azadirachta Leaf Extract, Simmondsia Chinensis (Jojoba) Seed Oil, Triticum Vulgare (Wheat) Bran Extract, Fragrance (Parfum), Linalool*, Citronellol*, Citral*, Geraniol*, Farnesol*, Benzyl Benzoate*, Limonene*, Eugenol*, Benzyl Salicylate*, Theobroma Cacao (Cocoa) Seed Butter. - Didn't irritate or make me break out - It made my skin OILIER - Expensive This product is supposed to "trick" your skin into producing less oil, you apply it every morning before moisturizing. I first tried using a tiny amount of the oil and applying it on my T-Zone however it made my skin oiler so instead I tried applying a generous amount but that still made my skin oilier. 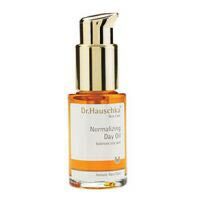 It was such a shame, I was really excited to try my first product from Dr. Hauschka's range.